फ़ोर्ब्स इंडोनेशिया के शुरूआत की योजना 2010 के मध्य के आरंभ में की गई। पत्रिका को मीडिया समूह पीटी वाहना मीडियात्मा के साथ साझेदारी के द्वारा प्रकाशित किया जाएगा. जनवरी 2010 में, फ़ोर्ब्स ने मैनहटन के फ़िफ़्थ एवेन्युमें स्थित अपने मुख्यालय भवन को न्यूयॉर्क विश्वविद्यालय को बेचने के लिए एक समझौता किया। सौदे की शर्तों का सार्वजनिक खुलासा नहीं किया गया, लेकिन फ़ोर्ब्स पांच वर्ष की बिक्री-पट्टे की वापसी व्यवस्था के अन्तर्गत उस स्थान पर अधिकार बनाये रखेगा. ↑ "Consumer Magazines". Alliance for Audited Media. अभिगमन तिथि February 10, 2014. ↑ Forbes, Malcolm S. (1989). Clark, Tony, संपा॰. More Than I Dreamed. New York: Simon and Schuster. OCLC 19222269. आई॰ऍस॰बी॰ऍन॰ 0671671219. ↑ Kroll, Luisa (2006-05-05). "Fortunes Of Kings, Queens And Dictators". Forbes.com. मूल से 2012-05-29 को पुरालेखित. अभिगमन तिथि 2010-05-04. Forbes, Malcolm S. (1974). Fact & Comment. New York: Knopf; [distributed by Random House]. OCLC 2696070. आई॰ऍस॰बी॰ऍन॰ 0394491874. Grunwald, Edgar A. (1988). The Business Press Editor. The New York University business magazine publishing series. New York: New York University Press. OCLC 17300233. आई॰ऍस॰बी॰ऍन॰ 0814730167. Holliday, Karen Kahler (1987). 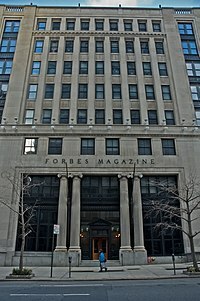 A Content Analysis of Business Week, Forbes and Fortune from 1966-1986 (M.J. thesis). Baton Rouge: Louisiana State University. OCLC 18772376. Kohlmeier, Louis M.; Udell, Jon G.; Anderson, Laird B. (1981). Reporting on Business and the Economy. Englewood Cliffs, N.J.: Prentice-Hall. OCLC 6487745. आई॰ऍस॰बी॰ऍन॰ 013773879X. Kurtz, Howard (2000). The Fortune Tellers: Inside Wall Street's Game of Money, Media, and Manipulation. New York: Free Press. OCLC 44131817. आई॰ऍस॰बी॰ऍन॰ 0684868792. Parsons, D. W. (1990) . The Power of the Financial Press: Journalism and Economic Opinion in Britain and America. New Brunswick, N.J.: Rutgers University Press. OCLC 496521134. आई॰ऍस॰बी॰ऍन॰ 0813514975. Tebbel, John William; Zuckerman, Mary Ellen (1991). The Magazine in America, 1741-1990. New York: Oxford University Press. OCLC 422903333. आई॰ऍस॰बी॰ऍन॰ 0195051270.